How does it work? What contaminants does it remove? Which size system should I get? Where's the best place to buy it? Keep reading to find the answers to these questions and more. You can click here to go to Amazon to ﻿find the most current prices of Berkey filters and see what other buyers had to say. How does the Berkey filter work? - Gravity! 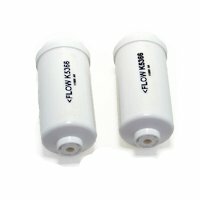 How fast does Berkey filter water? - It depends. How long do Berkey filters last? - A long time! Which Berkey Filter is Best for Me? Who Should and Should Not Buy a Berkey? The Bottom Line: Berkey is Worth Every Penny! Berkey filter systems work by using gravity. That's why sometimes they're referred to as gravity filters. The system is made up of two chambers and two to eight Black Berkey filter elements, depending on the configuration you choose. Optional fluoride filters can be attached to the black filters, too. You pour your unfiltered water into the upper chamber, which houses the filters. Gravity pulls the water downward through the filters. The filters have microscopic holes that allow the water to pass through to the lower chamber. The tiny holes block contaminants and sediment, so what ends up in the lower chamber is pure, delicious-tasting water. Then there's a spigot in the lower chamber for dispensing the water. 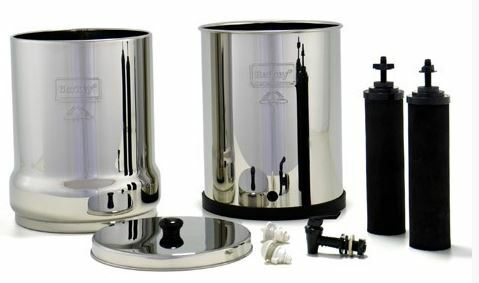 Except for the Berkey Light, all Berkey filter containers are made of high grade stainless steel. Berkey Light is made of a shatter resistant non-BPA plastic. It's not as heavy as the stainless steel models, so it's easier to transport, and you don't have to worry about denting it. It's great for camping or outdoor events. The spigot that comes with the system is made of BPA free plastic. You can buy a stainless steel spigot from Berkey Filters if you'd rather not have plastic. It'll set you back about $24. Another option that a lot of people like is the sight glass spigot. It allows you to see how much water you have left so you know when to fill it. The only other way to tell is by lifting the top chamber up and looking down in. It's not so easy on the bigger models, especially if there's water in the top chamber. I've managed to get along without a sight glass spigot, but you might want to have one. 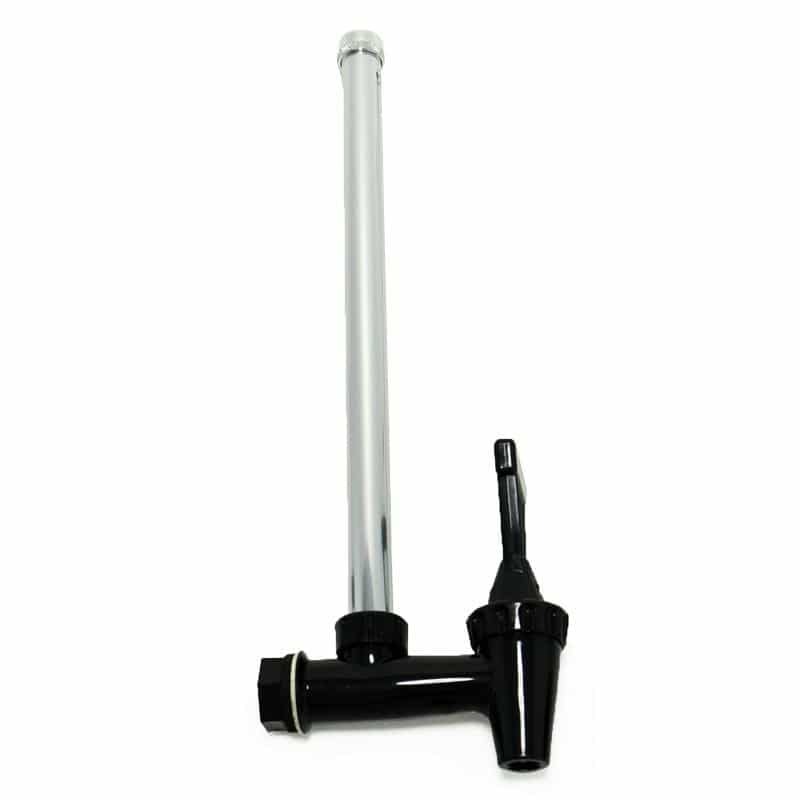 ​Check on the availability of the sight glass spigot at Amazon right here. Note that there are different size sight glasses for different size Berkeys. You can get a 6 inch high stainless steel stand for all but the Berkey Light. 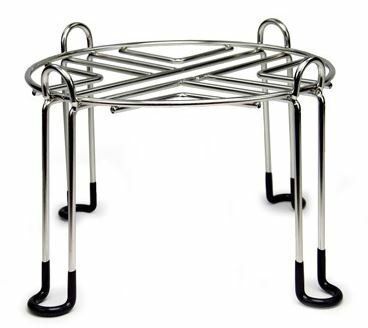 It has rubberized feet to keep it from sliding or scratching your furniture or countertop. This water filtration system is completely free-standing. You can set it on a countertop or on a stand. That means you don't have to deal with plumbing, and you can easily take it with you when you go on vacation or when you move. And by the way, if you want a really portable water filter, check out the Sport Berkey water bottle. It uses the same powerful filtration material as the countertop systems, but on a much smaller scale. The Black Berkey filters are a blend of carbon and five other media types. The Berkey PF-2 fluoride filters are made from non-BPA Polypropolene #5 and contain activated aluminum oxide for effective fluoride removal. For a great infographic that explains the various kinds of contaminants the Berkey filters remove, see the Quick Guide to Berkey Water Filter Contaminant Removal. Click here to see independent lab test results of the Berkey filters. Unlike some other filters, the Berkey does not remove beneficial minerals from the water. Distillers and reverse osmosis filters, for instance, take all the minerals out of water, including the good ones. It's not that big of a deal since we get most of our minerals from the food we eat. But some people want those minerals left alone. And by the way, that's why a TDS (Total Dissolved Solids) meter will still show the presence of TDS in water filtered by a Berkey. It's a measurement of the minerals in the water. Of course you can filter tap water (city or well water) through the Berkey, but what's really amazing is that you can put untreated water in it, too. So if you're in an emergency situation or if you're camping, you can take water directly from a stream or pond and filter it! Both the Black Berkey filters and the PF-2 fluoride/arsenic filters need to be primed before using them. That just involves flushing them out with water. You can do that using your kitchen faucet and the rubber washer that comes with the filters. It's kind of a messy procedure. I always end up getting soaking wet when I prime the filters. 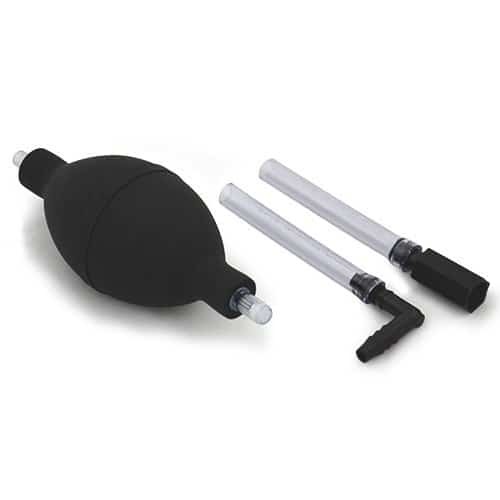 Berkey recently came up with a hand pump that makes the process simple and keeps you dry. Use the Black Berkey Primer to prime and to clean your Black Berkey filters. The filter just needs to be submerged in water when you do it, so you don't need to be at a sink. Please note that the pump only works with the Black Berkey Filters. The fluoride filters still need to be primed at the sink. Here's hoping that Berkey will come up with a pump for the fluoride filters, too! Most of the systems can take additional Black Berkey filter elements, and that will speed up the process. Also, after a while, the filters get a dirty buildup on the outside, and that affects their ability to take in water. So you'll want to take them out and scrub them every now and then with one of those scratchy green cleaning pads and plain water. Finally, keeping the upper chamber full of water makes it work faster. More water up there means greater pressure to force the water down through the filters. The chart a bit further down the page shows the flow rate of the different models. The Black Berkey filter elements are made to last a long time. I'm talking years. Exactly how often you'll need to replace them depends on how much water you use. Each filter has a life of 3,000 gallons. So, if you use 2 filters, you have a total life of 6,000 gallons. Divide the total life by the number of gallons you use per day, and you'll get the total number of days that the filters will last. As an example, I have 2 filters in my Berkey, giving me a total life of 6,000 gallons. When all the kids were living at home, I estimate that we used 5 gallons of water a day. So I would calculate 6,000 gallons total life divided by 5 gallons per day. That gives me 1,200 days of life for the filters. That's over 3 years for a family of seven! Not bad! The optional fluoride filters don't last as long. Each pair has to be replaced after 1,000 gallons of filtering. At 5 gallons a day, I'd need to replace them about every 6 months. All of the models work in exactly the same way and accomplish the same thing. Which one you choose will depend on how many gallons of water your household uses in a day. Generally speaking, you should plan on 1/2 gallon per person per day under normal circumstances. If the weather is hot or you're especially active, the amount of water you need will increase. If you plan to use the filtered water for cooking, you'll need to take that into consideration as well. You should also think about being prepared for ﻿emergency situation﻿﻿s like natural disasters. During emergencies, you need 2 gallons of clean water per person per day for drinking, personal hygiene, and cleaning. Berkey makes six different models and they each hold a different amount of water. They all filter the water at different rates, too, depending on how many filter elements they have. All of the models come with 2 Black Berkey filters. You can add more black filters to all but the Travel Berkey and the flow rate will be faster. So what you need to determine is how much water you need every day and how fast you want to be able to get it. ​You can get by with a smaller capacity if you add extra filters. Here's a list of all the models, the size household they're recommended for, how many gallons of water they can hold at a time, and how many gallons they can filter in one hour. It's important to note here that the flow rate is calculated with the upper chamber completely full of water. As the water level goes down, the flow rate decreases. So if you want to maintain that rate of flow, you'll need to refill the upper chamber frequently. 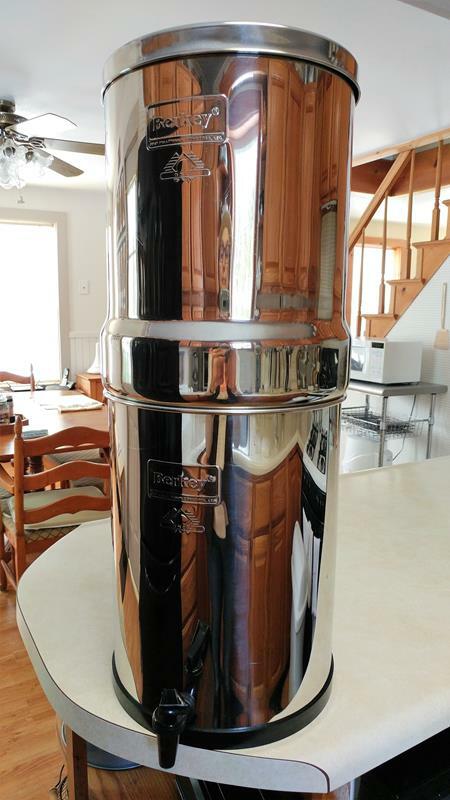 I own the Imperial Berkey, which hold 4.5 gallons. When I bought it, there were 7 people in my household, so we needed a minimum of 3.5 gallons of water per day. Some days we used more than that, and sometimes we used less. We never added any extra filters, but by filling the Imperial at least once a day, we always had enough water on hand. My trusty Berkey Imperial. Still going strong after 5 kids and 2 moves. We've been through a lot together! Based on the lowest price ($107) that I can find for a pair of Black Berkey filters, it costs about 2¢ per gallon for basic filtration, without the fluoride filters. The PF-2 fluoride/arsenic filters cost a minimum of $46 per pair, and each pair is good for 1,000 gallons. So that's about 5¢ per gallon. When you add the cost per gallon for the PF-2's and the Black Berkey filters together, the total cost goes up to 7¢ per gallon. Of course, if fluoride and arsenic are not a concern, you can skip the fluoride filters and the cost will be 2¢ per gallon. Note that this is only looking at the cost of filter replacement. It doesn't include the initial cost for the complete system. If you want a powerful water filter that sits on top of the counter, and if you don't want to have to mess with plumbing, then this is a good choice for you. If you want a system for everyday home use and for emergencies or for travel, buy a Berkey. No other filter is this versatile. On the other hand, if you want an under the sink filter that you don't have to refill by hand, then you might not want a Berkey. And if you're looking for a reverse osmosis filter, this is definitely not for you. In that case, you might want to check out filters by APEC or iSpring. Every Berkey distributor I checked out on the web is selling the systems for similar prices, and all offer free shipping. I did find some different bundle deals online. If you are planning to get the optional fluoride filters, it pays to look at the different options. Prices at Amazon are subject to change. That's why I don't include the prices in my reviews. But you can easily find the current price by clicking on the buttons below. 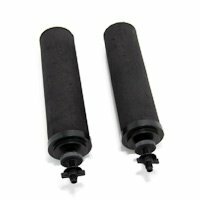 I would also suggest checking the price at BerkeyFilters.com. It's an authorized distributor that has bundled deals and other specials from time to time. Sometimes you can find scratch and dent models at a deep discount. Click here to visit Berkey Filters. The manufacturer offers a 12-month limited warranty on the systems and all of their components. In addition, the black filter elements are covered for 2 years. If you also want to filter your shower water, you'll be glad to know that Berkey has a high quality shower filter available. It reduces contaminants like chlorine, water soluble metals, bacteria, and algae. Please see What’s the Best Shower Head Filter? to learn more about Berkey shower filters and my other Top Four shower filter picks. I have to say that I love my Berkey filter and I have never regretted buying it. It's durable, it's powerful, and it makes water taste fantastic. And by that I mean no taste - like it should be! I love its versatility and portability. I love the security of knowing that if there's some kind of natural disaster or other emergency, I'm set. And I love knowing that the water my family and I are drinking every day is free of anything that might hurt us. I don't have to rely on somebody else to keep our water safe. Because we all know how that works out (or doesn't work out) sometimes! So, if you feel like the Berkey water filter is right for you, click here to ﻿﻿head on over to Amazon and check the current price and availability. Or click here to go to BerkeyFilters.com. You might also be interesting in reading How to Save Big on a Berkey Water Filter​. And if you're still not sure and would like to see how Berkey compares to other popular gravity filters, please see Countertop Gravity Water Filters: Which is Best? 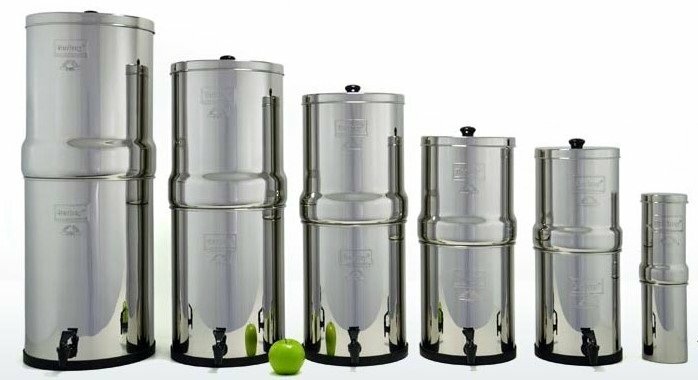 To learn more about all of the great products that Berkey offers, see Meet the Amazing Berkey Filter Family​.